A Glendalean since 1998, Dario Katardzic has spent most of his U.S. life in the City of Glendale. Having been born in Croatia and living most of his life in Bosnia, Dario and his wife Gordana have immersed themselves in Glendale and continue to enjoy watching the city grow and change for the better. In an effort to become more involved with the future development of Glendale, Dario joined the Glendale Planning Commission in 2012 and put his background in architecture to good use, while observing the city expand at a rapid pace. 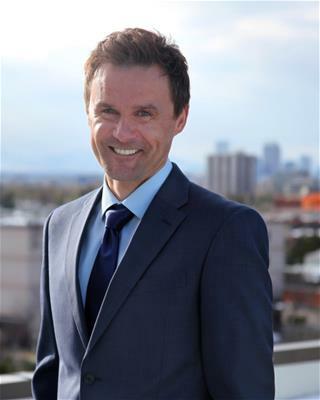 He appreciates the thought that has gone into the planning and development of Glendale and is a big believer that the city’s geographical position, being in Arapahoe County but also in the heart of Denver, is providing tremendous opportunities. In January 2013, Dario was appointed to the Glendale City Council. He is thrilled to represent the community in which he lives and describes the day he was sworn-in as one of the best days in his life since moving to America 15 years ago -- when he didn’t know a word of English. Serving as planning commissioner gave Dario a new perspective and experience that he will bring with him to city council, along with his love and passion for Glendale. Dario represents Glendale as the head of the Green Committee and as the co-chair of the Glendale Technology and Communications Committee Board. He is also a member of the Greater Glendale Chamber of Commerce and the Glendale YMCA Board of Advisors. Outside of his municipal duties, Dario works in the technology division of the City of Denver’s Department Technology Services. He also spent time, along with Gordana, working for a nonprofit organization that helps transition refugees. In his free time, Dario can be found running and biking on the Glendale trails with his wife. Both of them are also huge rugby fans and supporters of the Glendale Raptors. Dario is an avid soccer fan -- the Colorado Rapids is his favorite team -- and has been a triathlete and tennis player for most of his life. His family still lives and Croatia and Bosnia, and he visits them every year.